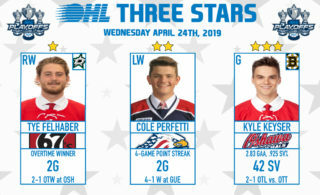 Morgan Frost (5, 6, 7) had a night to remember with three goals and an assist while Matthew Villalta stopped 41 of 43, giving the Soo Greyhounds what they needed to stay alive on the road and force a Game 6 with a 6-2 win over the Saginaw Spirit. Villalta stood tall early, stopping all 14 first period shots he faced while the Hounds took out a 3-0 lead through the opening half of the game. Jaden Peca (2, 3) scored twice while Keeghan Howdeshell (7) finished-off a nice pass from Frost. Jordan Sambrook, Mac Hollowell and Barrett Hayton each had two assists. The Greyhounds prevailed despite being outshot 43-22. 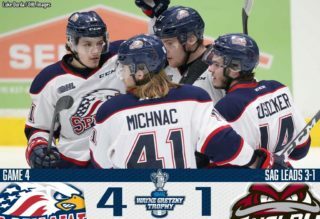 Albert Michnac (1) and Bode Wilde (5) scored Saginaw goals as the Spirit dropped a second straight decision and will have to go back to Sault Ste. Marie for Game 6 on Sunday night. 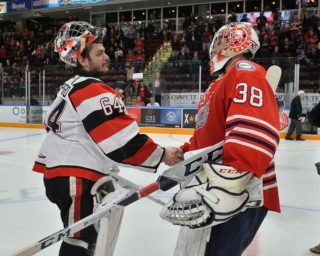 Anthony Popovich brought his A-game, making 35 saves to backstop the Guelph Storm to a 3-1 victory in London. The Storm wins again, climbing back into the series down 3-2 as Nick Suzuki (7, 8) potted a pair of goals in a hard-fought road win. 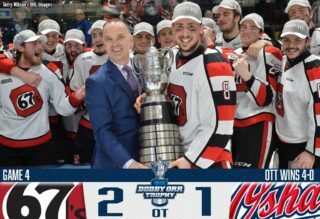 Domenico Commisso (2) opened the scoring for the Storm before London’s Alex Formenton (3) scored an equalizer off an offensive zone faceoff inside the final minute of the first period. Storm captain Isaac Ratcliffe would connect with Suzuki twice in the third, with a late empty netter sealing the deal for the Storm who return home for Game 6 on Saturday night. London’s Jordan Kooy made 32 saves in the loss as both teams went 0-for-7 on the man advantage.